The disappointment that Darwinists feel is due to their ideological devotion to their theories. In fact, they have seen their theory demolished, but ignore this, even though they are perfectly well aware of it. That they even resort to deceptive methods to cover it up is one of the greatest proofs of this. Instead of admitting the fact of Creation in the face of living fossils, they resort to irrational, illogical theories devoid of any scientific evidence. They seek to conceal living fossil specimens and eliminate millions of examples, while giving pride of place to hand-made hoaxes—a clear indication of their fears. The way that museums display countless fabricated fossil "reconstructions" and depict highly complex life forms like the coelacanth as examples of intermediate forms, while hiding away in the museum vaults fossils of species that still exist today is most thought-provoking. The reason is that Darwinism is a false religion and system of beliefs. Because it is a dogma that can never be denied. Because it is the basis of materialist philosophy that maintains that matter has existed for all time, and that nothing exists apart from matter. That is why, although new scientific evidence further disproves the theory with every passing day, such efforts are maintained to keep it alive. Yet these have now come to an end. The deceptive methods of Darwinism and Darwinists have failed. The evidence that demolishes evolution is mounting day by day. 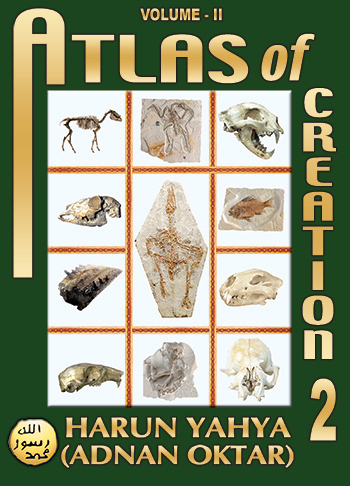 New proofs of Creation that dash evolutionists' hopes and force them to produce new misleading explanations are constantly emerging. That is why living fossils leave Darwinists speechless, and are quietly hidden away in museum vaults. With these methods, Darwinists try to conceal God's sublime artistry. The fact is, however, that God is He Who creates all things, Who knows all that they do, and Who keeps them under His rule at all times. God sees Darwinists as they make their plans against Him. God watches them as they seek to conceal His sublime creative artistry. He writes down all they do as they deny His existence. And, whether they believe it or not, willingly or unwillingly, they will be brought into His presence in the Hereafter. The existence of living fossils is a sublime proof created by God in order to eliminate all Darwinist strategies and reveal all their frauds. As they strive against the true faith, Darwinists forget that God also creates the evidence for it. They are in a state of defeat from the very outset. The teaching of the theory of evolution in schools, speculation regarding evolutionist claims by various media organizations, and the support gathered from scientists are all temporary phenomena. As revealed in the verse: "Rather We hurl the truth against falsehood and it cuts right through it and it vanishes clean away! Woe without end for you for what you portray!" (Surat al-‘Anbiya, 18), God will eradicate all false beliefs. 1 H. S. Lipson, "A Physicist's View of Darwin's Theory", Evolution Trends in Plants, cilt 2, no. 1, 1988, s. 6. 2 Sidney Fox, Klaus Dose, Molecular Evolution and The Origin of Life, W. H. Freeman and Company, San Francisco, 1972, s. 4. 3 Gordon Rattray Taylor, The Great Evolution Mystery, London: Abacus, Sphere Books, London, 1984, s. 36, 41-42. 4 B. E. Bishop, "Mendel's Opposition to Evolution and to Darwin", Journal of Heredity, 87, 1996, s. 205-213; ayrıca bkz. L. A. Callender, "Gregor Mendel: An Opponent of Descent with Modification", History of Science, 26, 1988, s. 41-75. 5 Lee Spetner, Not By Chance! Shattering the Modern Theory of Evolution, The Judaica Press Inc., New York, 1997, s. 20. 6 Michael Denton, Evolution: A Theory in Crisis, London: Burnett Books, 1985. 7 Charles Darwin, The Origin of Species: A Facsimile of the First Edition, Harvard University Press, 1964, s. 177. 8 Wynne-Edwards, V. C. "Self Regulating Systems is Populations of Animals", Science, vol. 147, 1965, s. 1543-1548; Wynne-Edwards, V. C. Evolution Through Group Selection, London, 1986. 9 Bradshaw 1965; Lee Spetner, Not By Chance! : Shattering the Modern Theory of Evolution, The Judaica Press, Inc., New York, 1997. 10 Andy Coghian, "Suicide Squad", New Scientist, 10 Temmuz 1999. 11 Colin Patterson, "Cladistics", Brian Leek ile Röportaj, Peter Franz, 4 Mart 1982, BBC. 12 Phillip E. Johnson, Darwin On Trial, Intervarsity Press, Illinois, 1993, p. 27. 13 Sanayi Devrimi Kelebekleri hakkında detaylı bilgi için bkz. Phillip Johnson, Darwin on Trial, InterVarsity Press, 2nd. Ed., Washington D.C., p. 26. 14 Jonathan Wells, Icons of Evolution: Science or Myth? Why Much of What We Teach About Evolution is Wrong, Regnery Publishing, Washington, 2000, s. 149-150. 15 Jonathan Wells, Icons of Evolution: Science or Myth? Why Much of What We Teach About Evolution is Wrong, Regnery Publishing, 2000, s. 141-151. 16 Jerry Coyne, "Not Black and White", a review of Michael Majerus's Melanism: Evolution in Action, Nature, 396 (1988), p. 35-36. 17 Stephen Jay Gould, "The Return of Hopeful Monsters", Natural History, cilt 86, Temmuz-Ağustos 1977, s. 28. 18 Charles Darwin, The Origin of Species: A Facsimile of the First Edition, Harvard University Press, 1964, s. 189. 20 Warren Weaver, "Genetic Effects of Atomic Radiation", Science, cilt 123, 29 Haziran 1956, s. 1159. 21 Gordon R. Taylor, The Great Evolution Mystery, New York, Harper & Row, 1983, s. 48. 22 Michael Pitman, Adam and Evolution, London: River Publishing, 1984, s. 70. 23 David A. Demick, "The Blind Gunman", Impact, no. 308, February 1999. 24 Pierre-Paul Grassé, Evolution of Living Organisms, Academic Press, New York, N. Y. 1977, s. 97. 25 Pierre-Paul Grassé, Evolution of Living Organisms, Academic Press, New York, 1977, s. 88. 26 Michael Denton, Evolution: A Theory in Crisis, London: Burnett Books Ltd., 1985, s. 145. 27 Pierre-Paul Grassé, Evolution of Living Organisms, Academic Press, New York, 1977, s. 87. 28 Stephen C. Meyer, P. A. Nelson and Paul Chien, The Cambrian Explosion: Biology's Big Bang, 2001, p. 2. 29 Richard Monestarsky, "Mysteries of the Orient", Discover, Nisan 1993, s. 40. 30	Richard Monastersky, "Mysteries of the Orient", Discover, Nisan 1993, s. 40. 31	Richard Dawkins, The Blind Watchmaker, London: W. W. Norton 1986, s. 229. 32 Phillip E. Johnson, "Darwinism's Rules of Reasoning", Darwinism: Science or Philosophy, Foundation for Thought and Ethics, 1994, s. 12. 33 R. Lewin, Science, vol. 241, 15 July 1988, s. 291. 34 Gregory A. Wray, "The Grand Scheme of Life", Review of The Crucible Creation: The Burgess Shale and the Rise of Animals by Simon Conway Morris, Trends in Genetics, February 1999, vol. 15, no. 2. 35 Richard Fortey, "The Cambrian Explosion Exploded? ", Science, vol. 293, no. 5529, 20 July 2001, p. 438-439. 36 Richard Fortey, "The Cambrian Explosion Exploded? ", Science, cilt 293, no. 5529, 20 Temmuz 2001, s. 438-439. 37 Douglas J. Futuyma, Science on Trial, New York: Pantheon Books, 1983, s. 197. 38 Levinton, Jeffrey S.; "The Big Bang of Animal Evolution", Scientific American, 267:84, Kasım 1992. 39 André Adoutte, Guillaume Balavoine, Nicolas Lartillot, Olivier Lespinet, Benjamin Prudıhomme ve Renaud de Rosa, "The New Animal Phylogeny: Reliability And Implications", Proceedings of the National Academy of Sciences, 25 Nisan 2000, vol 97, no. 9, s. 4453-4456. 40 André Adoutte, Guillaume Balavoine, Nicolas Lartillot, Olivier Lespinet, Benjamin Prudıhomme ve Renaud de Rosa, "The New Animal Phylogeny: Reliability And Implications", Proceedings of the National Academy of Sciences, 25 Nisan 2000, vol 97, no. 9, s. 4453-4456. 41 Douglas Palmer, The Atlas of the Prehistoric World, Dicovery Channel, Marshall Publishing, London, 1999, s. 66. 42 Mustafa Kuru, Omurgalı Hayvanlar, Gazi Üniversitesi Yayınları, Ankara, 1996, s. 21. 43 Mustafa Kuru, Omurgalı Hayvanlar, Gazi Üniversitesi Yayınları, Ankara, 1996, s. 27.